This episode of Biggest Loser Nation is brought to you by High Fructose Corn Syrup and new Blue Agave. 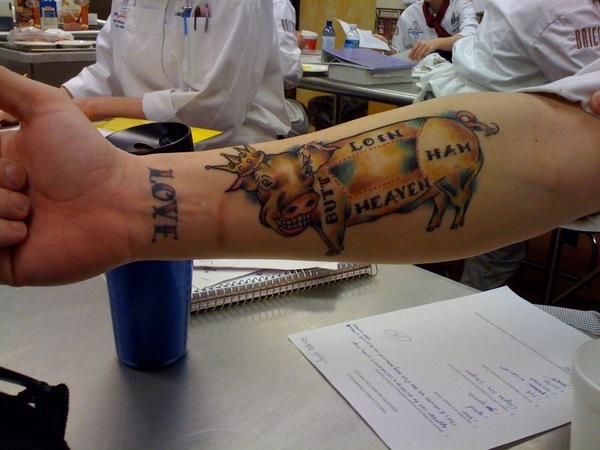 My friend Josh likes pig. Not quite as much as my chef, who visited his pig once a week while it was growing to feed it watermelon, but Josh has his own way of making a commitment. If you’re vegetarian, getting to know your food is certainly more dainty. Pick up a bunch of asparagus at the market and you never think about the rude, dirty hands that wrenched it from the ground and threw it into the back of a pickup. You never wonder if the asparagus liked life better back in the ground or if it is stressed by the crowds and the lights at the farm market. But if you’re an omnivore, well, yeah, you might have a lot of those thoughts. Like the language. You don’t go to McDonald’s and ask for some dead cow with lettuce and tomato because we don’t eat cow. We eat beef. Like we don’t eat pig. We eat pork. It’s nicer. Once you get past that to acknowledge that the chop on your dinner plate was part of a live animal a few days ago, the questions become more serious. What kind of life did this pig have? Did he grow up on a farm in Lancaster County where he roamed around the yard and got fed watermelon by a visiting chef? Or did he survive a brief existence on a factory farm in a filthy cage so tight he couldn’t turn around? Here’s what I know: the relatively small portion of your grocery dollar that goes for meat should support local organic, free-range farms where animals live a decent life before we kill them and eat them. The people in this LA Times story go a bit farther. This is no Halloween gross-out stunt. This class is just the tip of a very porky iceberg. In part, it’s the latest step in the ever-advancing search for connection to where our food comes from. “I’m all about a direct connection from farm to table and I want to take the next step into meat,” says Kanno, the tattooed, 33-year-old director of Long Beach’s Wrigley Community Garden.